When I was a Mouseketeer fan, I’d sit sideways in our wingback chair, sling my legs over an arm. Cuddled there, I devoured spoonfuls of Jif, wished to dance and sing like Annette Funicello. Before the wingback knew what happened, American Bandstand ambushed my childhood with backcombed hair. One day in the 60’s, Art Van delivered new living room furniture to our home, what today’s manufacturers tag “mid-century.” The starchy style permitted no comfortable way to lounge and watch television. My parents banished the old chair to the basement. Occupied with cheerleading practice after school, I forgot my rendezvous with the best seat in the house, until time for The Fugitive. I needed my cozy chair to ease the suspense and violence of Dr. Richard Kimble’s plight that fateful August night, 1967. Neighborhood friends gathered round our television with my sisters and me for the concluding fistfight between the innocent doctor and guilty one-armed man. Justice at last prevailed with a gunshot from the relentless Lieutenant Gerard. Barely two months after my high-school commencement, The Fugitive marked my right of passage into the unknown challenges of independence, responsibility, and integrity. Four years later, I found myself in Eastland’s J.L. Hudson where I sat in a wingback chair upholstered with green corduroy. “What do you think?” I asked my young husband. For the past forty-five years, we’ve hauled our favorite chair from house to house, the first and sole survivor of our upholstered furniture. When we moved here twenty-seven years ago, our wingback wanted another facelift. We bought new furniture instead. We hid our old girl upstairs in the guest room. One bright day, the idea of a slipcover struck me. 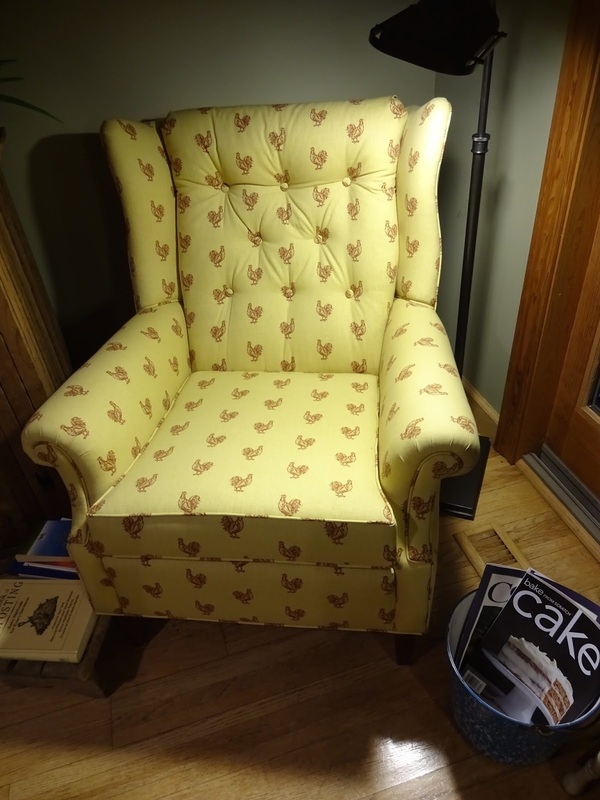 As if it knew its place, miraculously converted into our “chicken chair” with a hens and rooster print, she ended up in the sunny, kitchen corner. Perfect location for reading and bird watching. “I forgot how comfortable this chair is,” my older husband said. Too comfortable. Our senior citizen behinds sank into the broken-down frame, and the slipcover wouldn’t stay put. Regardless, our guests gravitated to our chicken chair, fell into her maternal embrace. Praise be, dear Reader! A local businesswoman referred a craftsman who fetched our darling to rebuild and upholster her for an affordable cost. We waited almost three weeks for her return. The reading lamp in the empty kitchen corner dozed over the enameled magazine bucket, a find from Armada’s flea market. The milk stool laid low holding Rodale’s book on composting. Forlorn for our friend, we speculated our chicken chair’s transformation. Truly, she’s charming with her hundreds of little hens. To celebrate her rebirth, today I sat sideways and munched on peanut butter, observed what I hope is Spring’s last snowfall. I pondered the unjust way of justice, the life of Annette Funicello, her suffering with multiple sclerosis. That she danced and sang when she could is some consolation. America’s Sweetheart left this earth three years ago this month. Do you hear her singing?